I’ve been using Tac-Bar for a while now, way before this contest. I love the product and the entire concept so I jumped on the chance to enter their $2,500 Prepper Contest. Embedded is my submission video I used to enter. In the video, I tried to demonstrate some of the possible survival uses for the Tac-Bar Ammo Can System. The Ammo Can contain 5 emergency food ration bars (2,500 calories each), water purification tablets, and a survival tin. The original Tac-Bar Ammo Can I had didn’t come with the survival tin and Aaron from Tac-Bar was nice enough to send my one. 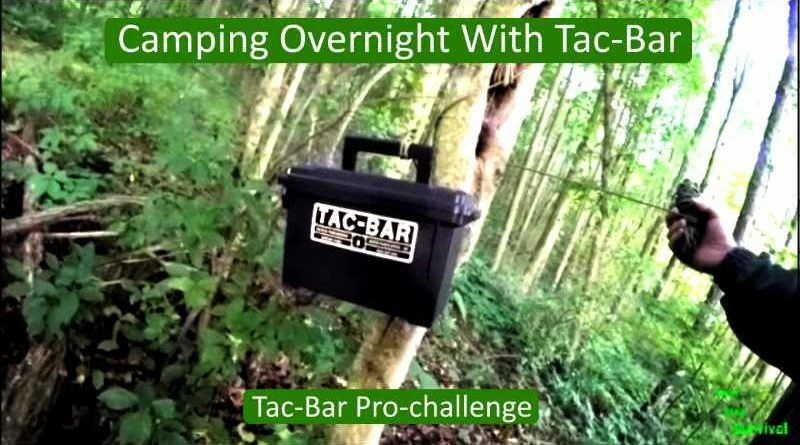 In the video I used the ammo can itself as a bear bag to hang my food overnight. I also used it as a bucket to collect lake water for my morning coffee. Then I used the muti-tool to feather a small piece of wood to start a fire. Then I used the magnesium steel fire starter and matches to start the fire. Truthfully, I have several hours of video and had to edit the majority of the footage, obviously. I was disappointed that I I lost several other use demonstrations due to the audio quality. I was trying to use a digital recorder to record the audio separately and that didn’t work. Live and learn, I’ve since set-up a clip mic for my Go Pro camera. I had a fun time recording an outdoors video for the @tacticalfoods Prepper Contest. I used one of my overnight hikes to demonstrate some of the survival uses of the #tacbar Ammon Can system, which I was using before the contest. You can see the YouTube video I recorded by clicking the link on my profile. ← What’s In My Get Home / SHTF EDC Bag?